In just two short weeks I will be going to my first blogger’s conference. Mixed Conference is taking place in Virginia and I am one of the lucky blogger’s who will be attending! I can’t wait to meet several of the ladies from my cooking board and several of the women from my Sunday Supper group. To get myself psyched up for the conference I decided to start baking up some goodies because they are having a cookie station set up where everyone will share a favorite cookie. 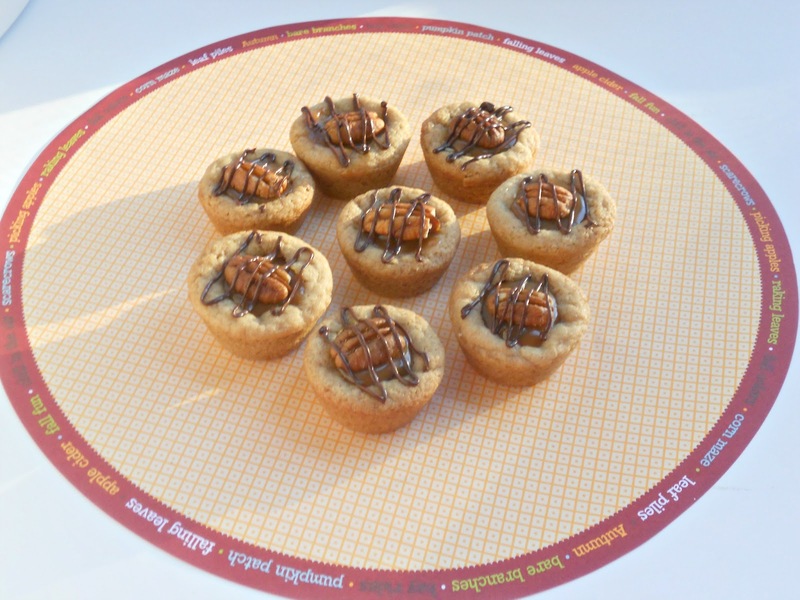 These turtle cookie cups have been several months in the making. My original idea was to make a sugar cookie dough, fill it with caramel, then top it with nuts and chocolate chips. That didn’t end up working too well because the dough never expanded and it ended up in an odd shape. After several trials I have come up with a delicious tasting and gorgeous looking cookie that I am proud to call my own. 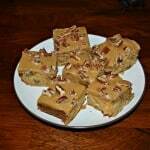 My cookie base is a sugar cookie base, but it is one that expands and doesn’t keep its shape. 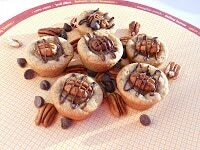 I then put a dent in the cookies and load them up with chocolate chips and chopped pecans. 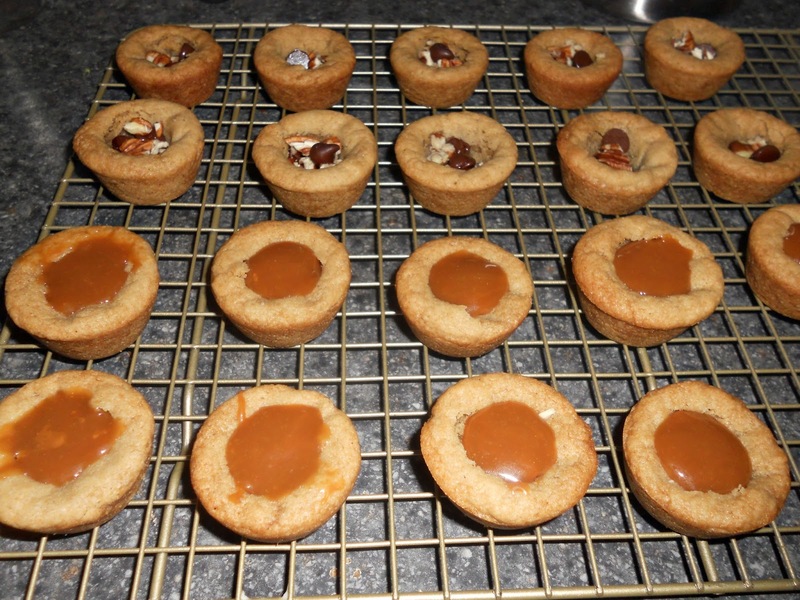 Hot caramel is poured over the top and then the cookies are decorated. The first bite into these cookies is pure bliss. Sugar, butter, nuts, caramel, and chocolate burst in your mouth with every bite. 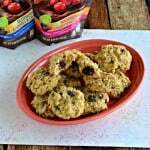 I’ve shared them with several friends and everyone agrees these are winner! 2. In a large mixing bowl cream the butter and sugars together. 3. Mix in the vanilla. Add the eggs in one at a time, mixing well after each addition. 4. In a medium mixing bowl combine the flour, baking soda, and salt. 5. Add the flour mixture in three parts to the butter mixture. Mix well after each addition. 6. Roll the dough into quarter sized balls. 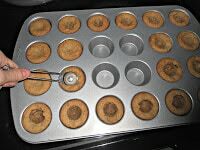 Place one balls in each cup of 2 mini muffin tins. 7. Bake for 12 minutes. 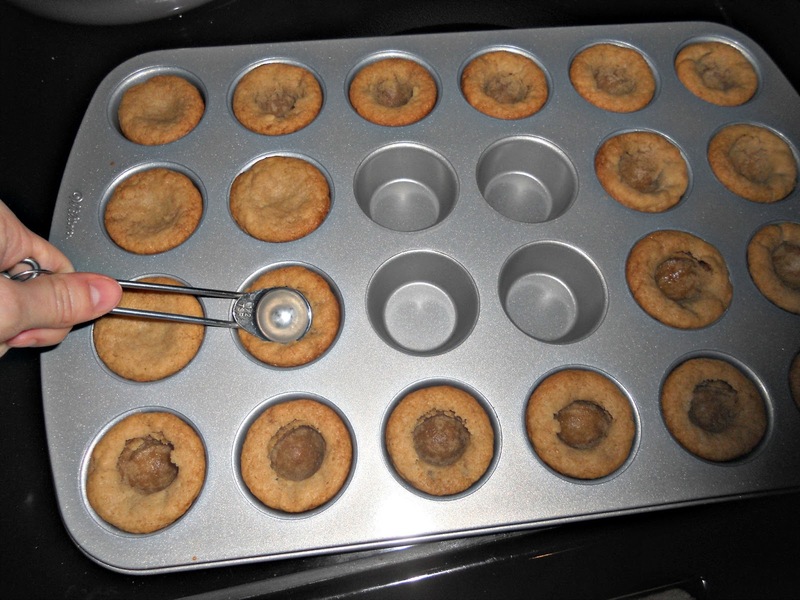 Immediately remove from the oven and use the back of a 1/2 teaspoon to make a dent in each cup. 8. Place several chocolate chips and a sprinkle of chopped pecans inside each cookie cup. Remove the cups and place on a wire rack to cool. 9. Meanwhile, heat the caramel bits in a small saucepan over medium heat. When they just begin melting add in the heavy cream and mix until they have combined and the caramel is smooth. Remove from heat. 10. 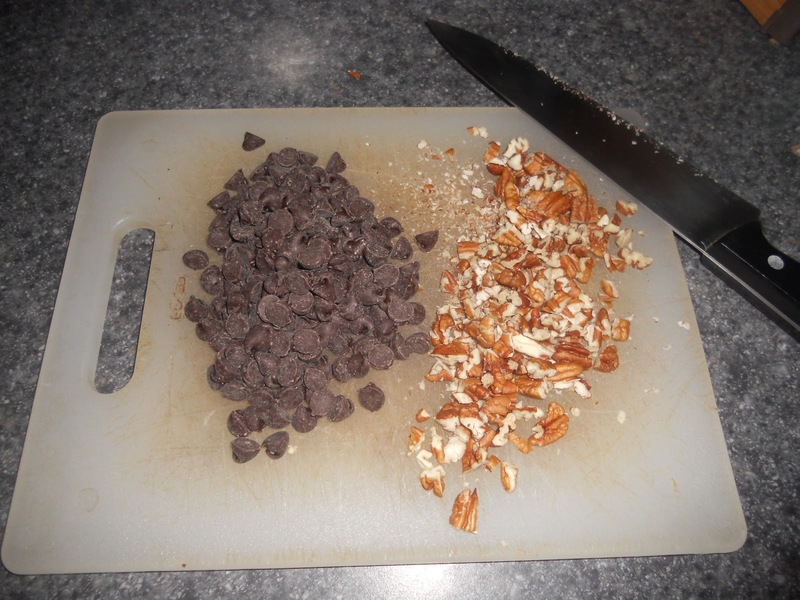 Using a teaspoon pour the caramel into each cup covering the chocolate chips and pecans. 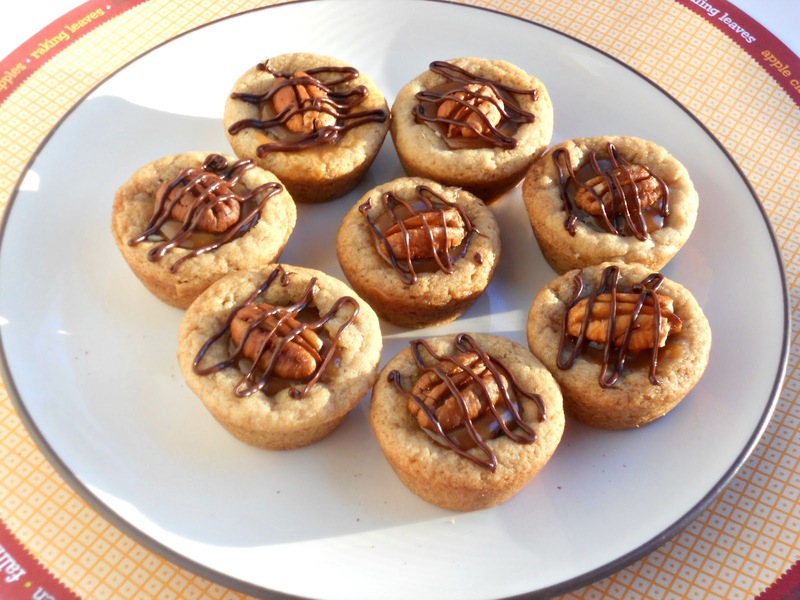 Quickly place a pecan half on top of each caramel filled cup. 11. Melt the remaining chocolate chips in the microwave checking in 30 seconds intervals. Remove from the microwave and spoon the chocolate into a small zip top baggie. Clip off the end of the baggie and drizzle the turtle cups with chocolate. 12. 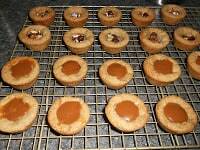 Allow the chocolate drizzle to harden and the caramel to cool, about 1 hour, before placing in an air tight container for storage. Beeeeeuuuuuutiful!!! The post is pretty too. I want to try these. My MIL is sending me some fresh (well I guess they are all fresh) Pecans. Now I’ll just have to be careful cracking them so I can have pretty halves. Oh My Yum! Glad you try, try, tried again, because this recipe looks like a home run! Thanks for sharing! 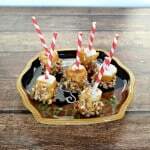 These sound like they would be fun to make with the GRANDkids! YUMMMY! Love turtle anything! You are being featured at Mealtime Monday tonight! Can’t wait to see what you bring this week!